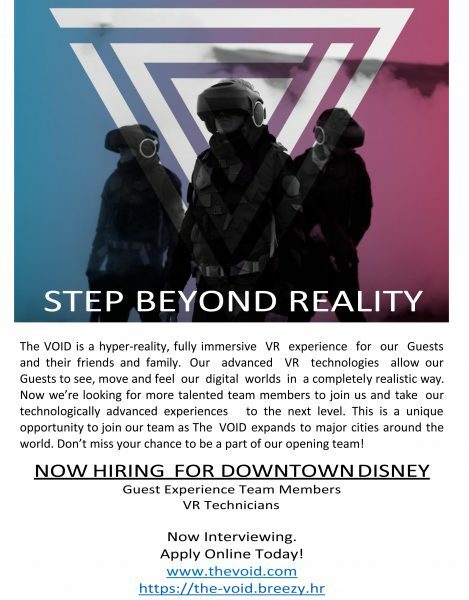 Great news for any Orange County, California locals looking to get into the growing world of virtual-reality– and anyone who’s dreamed of working at Disneyland Resort in a very unique capacity– The VOID is now hiring for its “Star Wars: Secrets of the Empire” experience, which opens this January in the Downtown Disney District. I had a chance to check out The VOID’s “Ghostbusters” experience recently at Disney Imagineering’s location in Glendale, and I can tell you this: I previously hadn’t been convinced that VR is the future, and that all changed when I stepped into that world. Players move around the virtual arena in actual physical space, from room to room. Reach out and touch a wall you see in your headset and it’s there. Step out onto a skyscraper ledge and you’re scared to even look down. I can’t wait to see what the “Star Wars” take on this brand of entertainment has in store. “Star Wars: Secrets of the Empire” promises to be even more exciting, building on the company’s existing history creating deeply immersive experiences and incorporating a beloved Disney-owned property that has only been growing in popularity in recent years. The story takes place during the era of “Rogue One: A Star Wars Story” and involves interaction with Imperial Security Droid K-2SO during a raid on the lava planet Mustafar. “We are currently in the process of recruiting a staff for our upcoming opening on January 5th,” said a representative of The VOID today, reaching out to Inside the Magic. “This is a unique opportunity to join our team as The VOID expands to major cities around the world,” the company stated in a flyer advertising the employment openings in Anaheim. For more information, be sure to visit The VOID’s official employment website. And for those simply interested in visiting The VOID’s “Star Wars: Secrets of the Empire,” the experience will open on Friday, January 5th at Disneyland Resort’s Downtown Disney District.